I’ve been a bit disappointed by the range of new Christmas chocolates in Supermarkets this year. 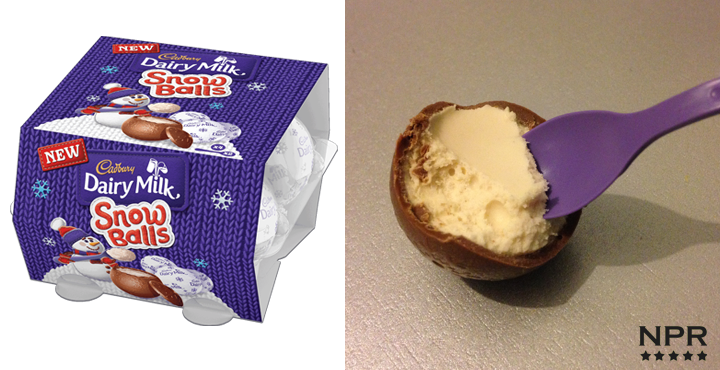 These Cadbury Snowballs are one of the few new products. These 4 round chocolate balls come 4 in a pack with 2 mini spoons for about £2. You have to but the top off before you can get into the soft center and the chocolate taste like a regular Cadburys milk chocolate taste but reminds me more of a Cadburys chocolate Creme Egg taste. The insides are like a partially soft, partially fluffy white center that is sweet but nice and tastes again like the stuff you get inside a Cadburys Creme Egg but a bit more Kinder like in flavour, its like a mix of both with a different texture. Together its a good rich chocolatey taste and tastes a bit like a Cadbury’s Caramel. Overall its a fun for the kids, you get to keep a couple of cool Cadbury coloured little spoons and it has good strong tastes. I think its a winner but I’d love to get the price down a bit though, especially for a 4 pack.